Energy supply choices dictate the power options of your fleet. For example, diesel fuel requires the use of internal combustion engines, and electricity requires the use of batteries. These energy options may not offer the most efficient options for the applications required by your fleet in terms of emissions, efficiency of energy used, or productivity and convenience. Hydrogen allows you to break free from the constraints of these energy supply choices. Used in a fuel cell, hydrogen produces electrical power that offers the convenience of fuel without reliance on the grid, which in the U.S. grid is still heavily dependent on coal. Hydrogen can be produced domestically from resources like natural gas, solar energy, wind and biomass with the potential for zero or near-zero greenhouse gas emissions. And, depending on your scale of use, on-site generation may be a cost-effective option. On-site hydrogen generation can eliminate the costs of delivered hydrogen, and simplify related supply contracts and logistics. According to Department of Energy forklift fuel cycle comparisons, fuel cell lift trucks powered by hydrogen produced on-site from natural gas and water use less energy compared to other forklift power alternatives. Among the cost drivers of electricity usage in your materials handling facility, lift truck battery chargers could be among the biggest electricity consumers. Battery chargers can also drive up annual peak demand charges for your facility. Fuel cell powered electric lift trucks run on hydrogen, not on electricity used to charge batteries, so their use could significantly reduce your facility’s electricity consumption. 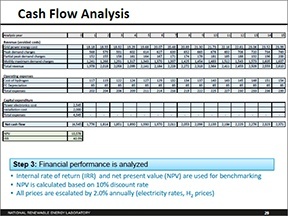 Get insights on this potential, including the pictured cash flow analysis, from a recent analysis by the Office of Energy Efficiency & Renewable Energy.